The entire Tsarnaev family immigrated to the United States in 2002, and more than 10 years later, the two boys took revenge. 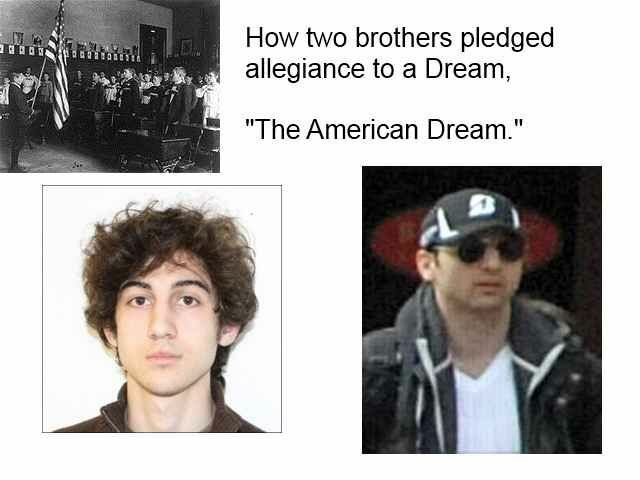 Here is one theory, a proposition about why Dzhokhar and Tamerlan Tsarnaev committed an act of terrorism at the Boston Marathon. What a fantastical and almost fanatical question to ask! They want me to take them to the American Dream. When I first started to travel, I thought this was great. I wanted to share my American Dream. And one time, I even tried to help two Ecuadorian women immigrate to the USA. This was about 12 years ago while hanging out in Quito, Ecuador. And now, after traveling the world for 15 years, I believe I understand that sharing the dream is more difficult than I thought. As I see it, the majority of people who immigrate to the USA do so for the wrong reasons. 1. Gain Money – Because immigrants believe all Americans are rich, they also believe that by speaking English and living inside the USA, they will be rich, too. 2. Gain Freedom – Immigrants want to be free from the rules of their own culture, and they believe the USA has no social customs or rules. Because of what they see on TV and stories they hear about the USA, they think that they will be able to do anything and everything they want, with no small community of elders telling them to stop. 3. Avoid Work – In immigrants’ home countries, the rich do not work, and so they believe that Americans, being rich, do not work. In 200 or more countries on the planet, the rich stay rich, and the poor have no ability to rise up. These countries are run like personal family mafias. 4. Rise in Social Class – In way, immigrants wish to rise up above the people in their own countries, but there is no way to brag because they are now in the USA. The people they wanted to look down on – and rub their own success into the others’ faces – are thousands of miles away. 5. Gain Love, Friends and Social Relationships – Immigrants’ dreams of finding an amazing American woman, for example, but they are like a square plug trying to fit into a round hole. They do not yet, and probably never will, fit into American culture well enough to attract an American super woman. They remain too foreign. As you can see, this is just a dream, but it is the American Dream in many ways – but not realistic, more of a fantasy. And they cannot return to their native countries, either. They would lose face. They are between two cultures, and they are without a culture of their own. When a dream is romanticized to the level of fantasy, reality slips away, and people want revenge. People get very angry when you destroy their dreams. They should return to their native culture, but they refuse because they would lose face. How do you tell your friends that you failed in the land of milk and honey, where the streets are paved with gold? You see, the people that did not immigrate to the USA, who remained home and still believe in the American Dream, would not believe it possible to fail inside the USA. Rage is an anger at self, which needs to find a victim. It is the belief that we all deserve what we want, are entitled to it. Americans tell the world that we are all equal, and the world believes that what we say is true, that “America is the Land of the Free” … as if money is free and there are no rules. I sat in Mosul, Iraq, talking with the owner of a hotel, and he said, “People are free here in Iraq. The Americans have liberated them. They are parking their cars in the middle of the road. They believe they can do anything they want.” Freedom is a belief that all rules are suspended, that there is no law, that there is nobody to tell you what to do. My normal explanation to people dreaming about the USA is this: “Why would you want to go to the USA and clean toilets? You are a big man here; you will be a loser in the USA.” I am seriously blunt. They need honesty, not fantasy; they need to know they will have to claw their way to the top of American society, just as they do in their home country. I say to these dreamers: “You can sacrifice yourself, and your children may one day understand and live the American Dream, but for you, you will never fit in. It is a foreign country. The American Dream is for Americans. Go figure! And first-generation immigrants are more than not on the same page: They are reading a different game book. And those rules slapped the Tsarnaev brothers one too many times. Read on Wikipedia about the Tsarnaev Brothers.